Join the discussion on our forums! 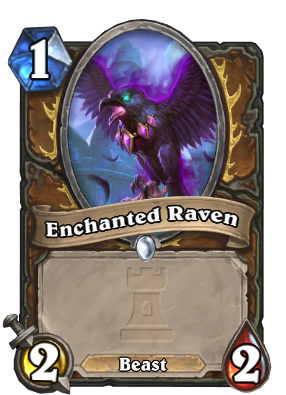 Come discuss Enchanted Raven over in our dedicated Enchanted Raven discussion topic. Great combo with Mark of Y'Shaarj in early game. 4/4 Beast + Draw a card - at second turn. Edgar Allan Brode strikes again! Actually it was Menagerie Warden. There are many versions of Beast Druid, and this bird is not in all of them. is this the three eye raven from game of thrones or just a normal 2 eyes raven??? This card is probably a reference to the fact that Medivh can shapeshift into a raven. So, just two eyes. This card is power creep on Claw. lol. 1) Amazing early game plays! After zombie cho left with the rotation, we started relying more on class cards to get a good early. Druid already have living roots in his arsenal, which means we can have a very consistant early game if you can moligan to any one of your early game plays. 2) Beast druid? This combo alone of raven and mark can prove to be strong enough to make 2 marks viable, which means putting beasts is suddenly better. I think that we just need one more beast synergy and this deck will become crazy viable. 3) God forbid, but maybe aggro, this card is annoying to get rid of because he has more than one hp, but the fact that he has 2 damage can cause a really long term damage. I can easily see the raven dishing an average of 6 damage a game if played on turn 1, which is pretty close to how the leper gnome faired in aggro. This card might be able to give druid another push forward. This card with living roots could give Druid some of the best early game in Hearthstone, which will really help the class across the board in dealing with aggro. this card for me is borderline "broken". There are many minion who can kill it turn 1 whitout major problems, yet this make almost any turn 1 1/2 minion unplayable agaisnt druid. 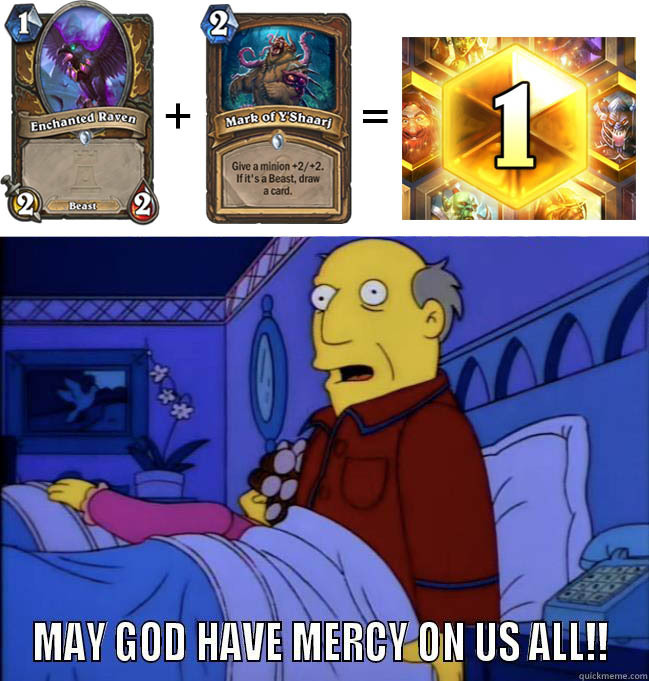 But the true power of this card resides in the turn 2 mark of Y'shaarj on this thing, which can simply make this thing absurdly hard to remove. The fact that is a beast is also a pretty big deal. It does trade evenly or worse with most one drops in the meta, but it kills most two drops in the meta. This card is not that impressive tbh. We're going to see this same thing with +1 health or attack eventually due to power creep. I doubt this alone would make Beast Druid viable, and if beast druid becomes viable, this may not even be in the deck. I could see this going both ways. It can become a staple, or it can be another one of those 'dust it' cards. Depends on what else comes out. Just because it has not affected 1-drops, does not mean it will not in future. Also I was not implying this was powercreep. I am merely stating that I am sure in future we will see a 2/3 or a 3/2 with no downside, it will probably be in druid aswell. Beast Druid already very much viable. Just ask Thijs. Enchanted Raven is a good and balanced card. It would be autoinclude in all Druid decks if roots wasn't a thing but it will definitely find its way into Beast Druid.